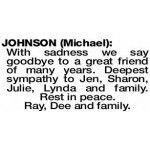 The Funeral Service for Mr Michael Johnson of Helena Valley, formerly Swan View will take place in our Bowra O'Dea's Midland Chapel, 131 Great Eastern Highway, Bellevue commencing at 11.00am THURSDAY (28.03.2019). Cremation will take place privately at a later time. 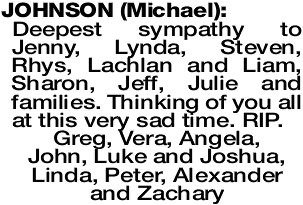 Deepest sympathy to Jenny, Lynda, Steven, Rhys, Lachlan and Liam, Sharon, Jeff, Julie and families. Thinking of you all at this very sad time. RIP. With sadness we say goodbye to a great friend of many years. Deepest sympathy to Jen, Sharon, Julie, Lynda and family. Rest in peace. Ray, Dee and family. Deepest sympathy to you Jen, Julie, Sharon, Lynda and families. A real gentleman. Mick, you will be sadly missed.